The ScotRail Borders Railway project has reached a significant landmark with driver and conductor training commencing on the 49km stretch between Tweedbank and Newcraighall. At a ceremony held at the nearly complete Tweedbank station, Keith Brown, Cabinet Secretary for Infrastructure, Investment and Cities, visited the trainees before teaching commenced. A total of 64 drivers and 64 conductors are set to be trained on the route reaching speeds of up to 90mph. The training schedule will last 12 weeks culminating in the first train running in the Borders after more than 40 years. Phil Verster, ScotRail Alliance managing director, said: “Like all of our staff, the team who will be trained on the route have already proved that they have the essential mix of experience, concentration skills and good attitude required to be successful train drivers and conductors. “Twelve of the trainees are from the Borders themselves and understand how the return of rail services to the area will transform the local communities. 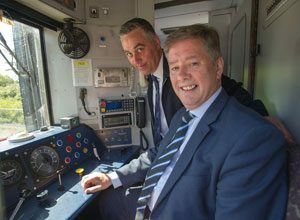 Infrastructure Secretary Keith Brown said: “It’s been a journey of almost half a century, but we are now finally seeing ScotRail trains making their way along the Borders Railway route. “I met with these trainee drivers during their classroom-based training in November 2013 and they told me then how excited they were at becoming a part of history by taking the controls of these long-awaited trains. “That dream is now a reality, as the reopening of the route will be for so many in the communities of Midlothian and the Borders, as well as Edinburgh.